Lujong is a fun toy full of motion, color and texture. The photos don't do this toy justice. 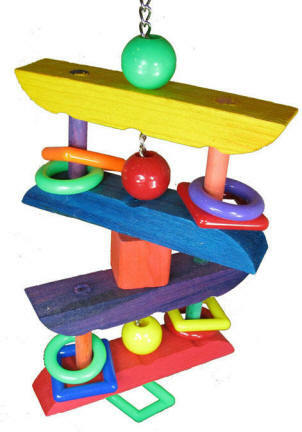 There are two separate "squares" that are held together with wooden dowels with marbella rings/squares for a cool sound and extra chewing fun. These two "squares" are hung on heavy duty nickel plated welded chain for added to his durability, with large colorful wooden block separating the "squares". Topped with a quick link for easy hanging ... this is a perfect toy for the mid to larger sized beaks in your life!